OTP or One Time Password is a safe and convenient form of user authentication. It protects you against typical financial fraud but vishing fraudsters are on the lookout to lay their hands on your OTP. 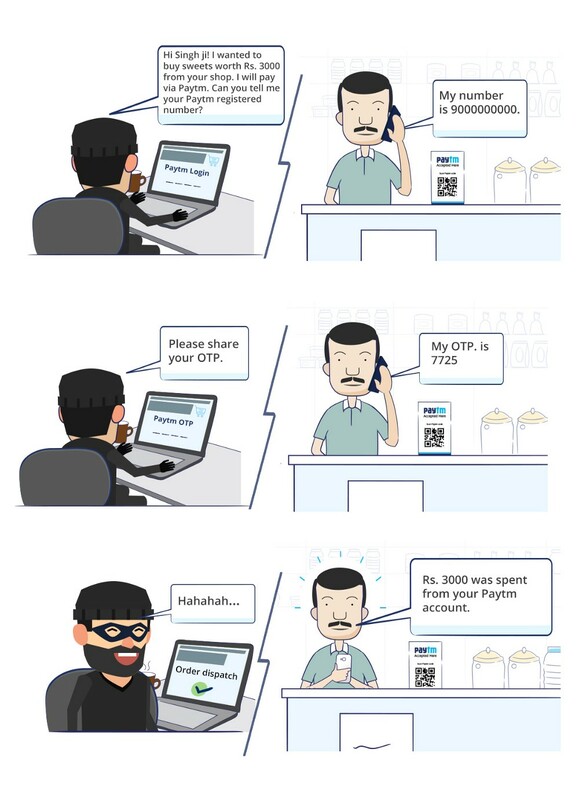 DO NOT ever share your Paytm OTP with anyone, especially when over a call, SMS or e-mail. There is a catch here — while an OTP is a convenient way to authenticate, it is important you never fall into the trappings of fraudsters and share your OTP. The combination of your Paytm registered mobile number and OTP or Card details and OTP can be misused in a variety of ways. You must not share it with anyone even if the person claims to be a Paytm or Paytm Bank employee, Customer Care employee, Bank Employee, Paytm Agent, Paytm KYC agent, RBI Official, Income Tax Officer or even someone who wishes to pay you by asking your OTP. Point to remember: In case you wish to log into your Paytm Account or pay on a third-party website or app using your Paytm Account, you would receive an OTP for verification before you can proceed to pay. This is also how you link your Paytm Account to third-party platforms like BigBasket, Swiggy, Zomato, eBay, etc. Imagine receiving a call like this where the person on the other side wants to pay you using Paytm! The next time you receive an SMS, e-mail or call asking for your OTP, don’t engage and just cut the call! Report the number to our Customer Care, and we will look into it instantly.